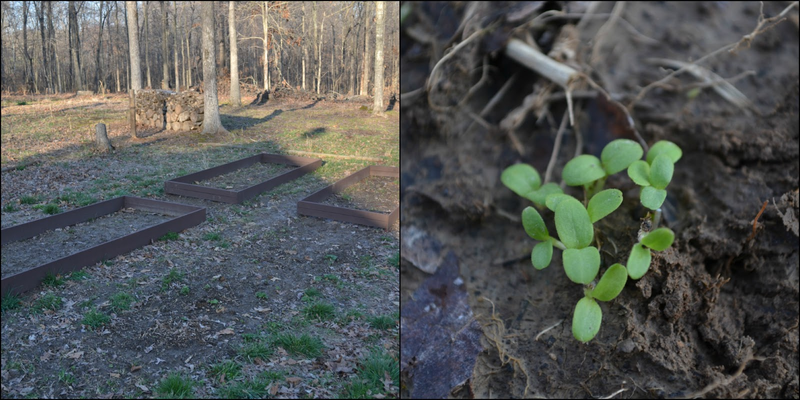 Over the weekend I finally had a chance to walk around and see what new growth (if any) was going on in the garden and the woods. We haven't been able to do much work on the garden just yet, but we do have a few boxes laid out for containing our vegetables. We still have quite a few boards left to paint then assemble, a fence to construct, and some stone to place so it's still very much a work in progress. A few weeks ago we did manage to plant some lettuce seeds, so I'm hoping that is what I saw shooting up in the garden. I have been so amazed with how well our herbs survived and even thrived through the winter months. 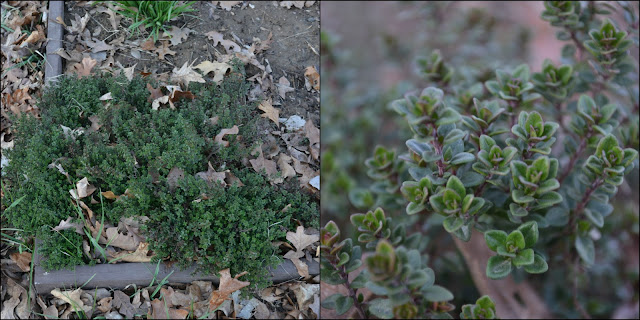 I haven't checked them out lately, so I was shocked to see how much the thyme had spread. I noticed the sage still holding strong and the mint just starting to make a comeback. Excited with the state of the edible plants, I went to see how the rest of the garden was doing. I saw some encouraging signs of growth - shoots of bright green from bulbs popping out of the ground (lilies I think?) and some of our sedum coming back in full force. Over by the creek I saw a few of the trees were finally showing some green as well. What's going on in your garden lately? How lovely! It's so heartwarming to see new life awakening! LOVE the new header - and I love to see everything popping up all over! Your raised beds Tammy - are they 4x8? Going to try one this year (always have done earthboxes, containers in the past) and want to get the right dimensions! Thanks! Love the frames for your garden beds! I am hoping to do that this year as well - instead of just relying on the rows that I eyeball each spring. I think it will make for a neater looking garden. Good to see that your herbs made it through the winter. I want to do a little herb garden bed that hopefully will over-winter well...we shall see! Looks wonderful! I love to watch the perennials come up this time of year...looks like your herbs and flowers are going to be beautiful this year! You had a lot of stuff that fared well! Wow! It was nice to see so many things starting to come up! :) Sure makes you feel good. My garden is still fast asleep, nothing happening. Just got the ice away so I could get in there to get to my chicken coop which is in the same fenced area. I can't wait to get to work and get things sprouting! :) I want my rhubarb to come up so I can make a pie :) Beautiful pictures! Do you dry your herbs for winter use? Oh, I'm so jealous of the herbs you have sprouting up! I would love to cook with those!!! I would also love to build garden beds, like yours; I'm just not sure if we will do it or not this year. My plan is elaborate and involves a new fence for our yard....so...not so sure we will get to move on it. What else do you grow over the summer? My son received the cutest little starter garden yesterday, which included watermelon seeds....so curious to know if they will work in my area?!?! It is so fun to see mother nature awakening once more! Great pics Tammy! I would LOVE a wood behind my veg beds! Everything looks so promising, doesn't it? Love the new header! We were spared the "brown-out" this year. We have stuff bloomin' all over the place. I have about 6 gardening posts in draft form, waiting to be finished and posted. Enjoy the springtime! I like your photos and all the green. I have garlic and onions so far, my peach tree is blooming and the wild flowers are coming along and should start blooming soon too. Yay, for spring! The first greenery and budding is so thrilling. How delightful for you! It is wonderful to see all the new growth and your plants making a comeback. So happy that spring is here. Great shots, Tammy! Have a happy week! Oh, to have those herbs growing already.. I can't imagine.. Our garden is bare but just.. smile..
Looks lovely already, gal! So, so, so excited to see green and flowers....winter wasn't all that cold but it just seemed to drag on. And on. Woohoo spring! All that new green life is VERY exciting! Now if we could only get some sunshine! Our lettuce hasn't sprouted yet, hopefully soon. The marjoram and thyme haven't started new growth yet, hopefully they survived. I have four mints in my mint garden, and so far only the Sweet Mint has made a comeback. You have me eager for springtime and gardening! Looking good! I am always amazed too at how herbs can survive the winter-they are very hardy! Oh I know Tammy cold weather has dragged on here too, but the past few days little signs of Spring. Crocus popped up, I see Peony shoots , our mint and sedum coming back too. Things are starting to have some growth spurt slowly but surely. If things warm up just a bit there will be an amazing growth spurt I'm sure. I never knew how much I loved the color green. I sure have been missing it for the past six months! Beautiful pics - thanks for sharing! How exciting for you to have all the new growth coming up! It is past time for spring! My husband and son were working on our flowerbeds today, giving them new dirt and planting flower bulbs. Can't wait to see what blooms! Love all the new growth in your garden. It excites me to see my plants doing well. At the moment, my chilli plant is going nuts! I wish I had the yard for a garden, but I just don't, so I have to resort to shopping at my local farmer's market! I like your updated header picture, shoot I like all your header pictures they are very clever! My irises actually have buds and I hope to have blooms later this week! It's amazing how the plants know when to grow despite the weather! My greenhouse is filled with seedlings waiting for the gardens to be cleaned, and the weather to warm! These glimpses of spring are so lovely! Thank you for sharing... now I can't wait for spring to come to "my neck of the woods". I am going to start a new herb garden this summer. Spring can't come soon enough, I am so ready to start my gardens! Nice! It's exciting to see new life in the garden. About all I have so far is a couple crocuses that I think are volunteer (because I sure don't remember planting them) and the beginnings of my hostas. Yeah - I think Spring is coming! Well. I'm a little jealous. All I've done is spread compost. I didn't even get a chance to turn the soil before we had 8 inches of snow. Now that the snow is melted and I have a day off, it's raining. Not complaining though, we need the moisture! All you herbs make me excited for our 'signature' cream cheese. ALl we do is go around the garden, collect all the herbs we can find, chop, whip it with cream cheese and spread on a bagel. You have enough to do that now! Mmm!!! So glad spring is at your door. Enjoy! Yay for spring! We had such a mild winter this year that quite a few herbs over wintered well. It's warming up in Atlanta so I'm getting ready to refresh some of my beds this weekend and start planting. I still have row covers on my beds from my winter garden so that should protect my new plantings for the time being until the night time temps warm up. That is so exciting to see green in your garden! It gives me hope that I will see green some day soon! I hope you will be eating garden fresh lettuce soon.... Even though I will be crazy jealous! Wonderful returns of growth in your garden. I am excited for you! Hooray spring is coming!! You just reminded me that I want to plant some mint! Most of my gardening is indoors right now. Hopefully, I'll get a few seeds planted outdoors today or tomorrow. Such a weird spring, isn't it! Well what a sight and a wonderful one at that. So happy to see some green in your neck of the woods. Ja de lente komt eraan je ziet en je ruikt het,heerlijk. Tammy - now that's a garden! It puts my pocket handkerchief pot based garden to absolute shame. We are just about to go off daylight saving here so it is officially autumn - although the days are still nice and warm. Have a great week. Tammy I love the Spring updated header, I am tired of winter too. My mint has resprouted as well. I even enjoyed a pinch in my tea last weekend, yum! We are still working on our coop design. I've got some great ideas that I will be sharing soon on the new chicken blog. Looks like a GREAT start! We're just now seeing more ground than snow. :sigh: I expect that we would even be able to plant cool weather crops until the end of the month or early May. Such a short season here! Beautiful - it's nice to see some more green than we have. I could just cry with relief that spring in FINALLY here. Longest winter ever. Thanks so much for sharing with us at Eco-Kids Tuesday! Hope to see you there again today!